Today was a glorious snowday for my entire family! I had written before about my family resolutions for 2013, which included getting more active and eating better. Yesterday, I wrote about the large snowfall in the Greater Toronto Area and discussed some of my childhood memories. Well, today was for making new memories with the kids! From playing in a snow fort in a snowbank, to taking out the crazy carpets to fly down our local hill! Even Mamma got a solo run down the hill, which you can see in the video above! But I stick by the motto: "The Family that plays together, stays together! ", as this was definitely a family day filled with fun, laughter, and teamwork. Someone remind me to buy a pair of snowpants: my backside was totally soaked! However, it was a beautifully sunny day and the sun felt wonderful on my face! Mommy Suns Herself, while Dad and the Kids Take Another Run! I hope that when our kids are older that they remember the quality time we spent together. My oldest son remarked as we were leaving today: "Mommy, this was my best day sledding ever!" He wanted me to ask why, so I did...I was hoping that he was going to say because we were all together. Instead, he noted it was his best day ever because he got to go down the crazy, bumpy hill. I hope when he is a much older man, he remembers the crazy, bumpy hill...and that we all did it together. What are some of your best family memories, either now or as a child? Sweet! Making family memories = so important! So glad you got to have some family time and make the most f of your time together. Christine, I get to do it again tomorrow...enjoying the snow while it lasts! The video was fantastic, rotflmao! OrangeHeroMama, go out on a warmer day. It's true the cold isn't for everyone! I haven't seen snow in so long!! I hope maybe next winter we will get some. Some of my best memories as a kid were sledding! Megan, I also have great memories of sledding down a gigantic hill. 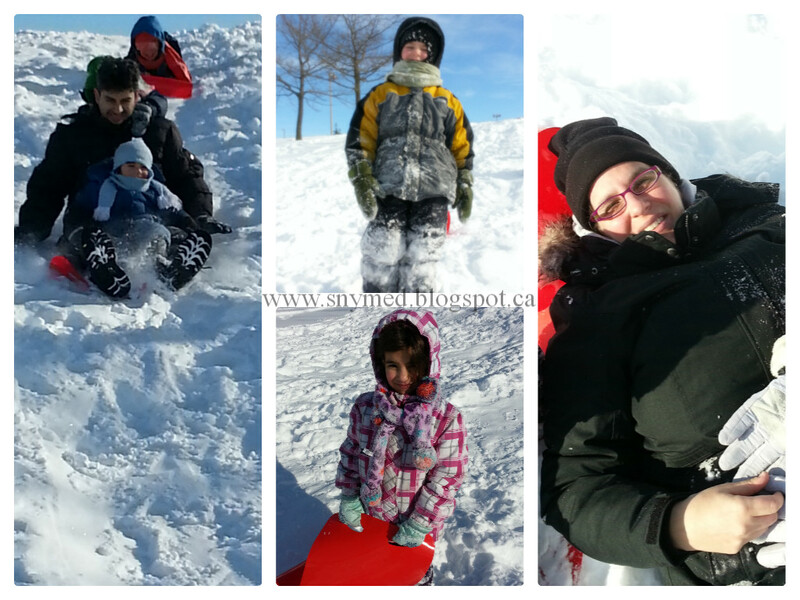 Flying down a hill with 5 kids piled into one sled, those were the days! Thanks Torviewtoronto! I'm glad you also had a good time outside! mamawee, we also went sledding this morning! The kids loved it: the hill was a bit iced up and we flew! Susan, it sounds like you've got the cool house on the block! So fun! I remember going sliding as a family. We would spend hours at that hill. And come back home completely exhausted. Thanks for sharing your family fun! Awwww, I want all that snow! I just moved from the mountains, where I lived for 21 years and it has not snowed here in 3 years...ughhhh. I'm so glad someone else enjoys the snow. We just moved away from it, to the East coast where there are beaches and sun year round. My kids love the snow, but my Husband and I hate it. It looks like ya'll had some fun! looks like a bunch of fun! My best snow memory is when we built a igloo and slept in it opver night in the front yard! It was awesome! what a great day. my kids aren't in school yet but I look forward to the day that the kids are both old enough to go sledding and/or skating.